1125 The king resides a short time at the King’s House within the Manor of Sceanes (Shene). 1299 The king resides at Shene with his court. 1300 Accounts of the expenses of the royal household still exist. 1305 At Shene, the king gives an audience to commissioners sent from Scotland, following the execution of William Wallace. There they arrange the submission of the Scottish government. 1309 Holds a council at Shene. 1310 Grants the barony of Alnwick to the Percys at Shene. 1312 Becomes direct owner of the Manor of Shene. 1314 After his escape from the Battle of Bannockburn, the king founds a monastery for 24 Carmelite Friars at Shene. 1327 Grants the Manor of Shene to his mother, Isabella, for her lifetime. 1358-1370 On the death of Queen Isabella, the widow of Edward II, the king spends over £2,000 on the reconstruction of the palace. 1368 Geoffrey Chaucer is appointed Yeoman of the King’s Chamber and serves at Shene. 1377 On 21st June, about the seventh hour after noon, the king dies at Shene in his sixty-fifth year. 1377-1394 The king marries Anne of Bohemia on 22nd January 1383 and they choose Shene to be their principal royal residence. 1384-1388 A timber-framed house is built for the king ‘within a certain island called La Nayght’ opposite the manor. 1389-91 Geoffrey Chaucer holds the post of Clerk of the King's Works. 1394 On Whit-Sunday, 7th June, Anne of Bohemia dies of the plague at Shene, aged 28. On 9th April the following year, the king orders that the manor be demolished. 1399 The king rests at Shene on his way to imprisonment in the Tower of London. 1414 The king orders the rebuilding of the royal manor at Shene; this is described as ‘the kynges grete work’. He also founds a Carthusian monastery - the Charterhouse of Jesus of Bethlehem at West Shene and the Monastery of St. Bridget of Syon at East Twickenham. 1466 The king grants the royal manor of Shene to Elizabeth Woodville, his Queen, who makes it her chief residence and holds it until it is reclaimed from her by Henry VII in 1486. 1497 On the 23rd December, whilst the royal family are in residence at Shene, a great fire destroys most of the manor buildings. A palace of ‘glittering magnificence’ is afterwards built there for the king, who re-names the manor Richemount (Richmond) in 1501. 1502 At Richmond Palace, on 24th January, Princess Margaret, the eldest daughter of the king, is betrothed to King James IV of Scotland. 1509 On 21st April, the king dies at Richmond. 1509 The king celebrates Christmas at Richmond Palace with his Queen, Catherine of Aragon. 1511 On New Year’s Day, the queen gives birth to a son who only lives until 22nd February. 1515 Mary, the king’s sister and widowed Queen of France, marries Charles Brandon, Duke of Suffolk, secretly in France. On their return to England they reside at Kew. 1537 On 12th October at Hampton Court, Jane Seymour gives birth to Prince Edward, the future Edward VI. She dies 2 weeks later at Richmond. 1540 Richmond Palace was granted to the divorced queen, Anne of Cleves – Henry’s fourth wife – who entertained the king and his daughters there on several occasions. 1543 In June, the king and Catherine Parr – his sixth wife – are married at Hampton Court. 1548 Anne of Cleves hands Richmond over to Edward VI, formally surrendering her interest in the palace to him on 3rd June 1549. 1550 The king attends the marriage of Sir Robert Dudley and Amy Robsart at Richmond Palace on 4th June. 1554 The queen and her consort, Philip II of Spain, spend their honeymoon at Hampton Court and Richmond. Princess Elizabeth is held prisoner at Richmond. 1559 From the year of her coronation until her death in 1603, the queen spends increasingly longer periods at Richmond. 1586 The queen writes to the Lord Mayor of London from Richmond informing him that he must publish and proclaim the death sentence passed against Mary, Queen of Scots. 1588 At Richmond, the queen and her advisers make plans for the defeat of the Spanish Armada and order the firing of the warning beacons. 1603 On the morning of 24th March, the queen dies at Richmond. 1604 The king attends the conference of Anglican dignitaries and Puritans held at Hampton Court, after which the compilation of the Authorised Version of the Bible is begun. 1604-1612 Henry, Prince of Wales, is resident at Richmond. His improvements to the Palace include a picture gallery for the royal collection. He dies on 6th November 1612, probably of typhoid fever. 1617 The Manor of Richmond is formally granted to Prince Charles – later Charles I. 1625 The king enlarges his late brother’s art collection at Richmond Palace. He lives there and at Hampton Court while the plague rages in London. 1637 ‘Richmond New Parke’ is enclosed by order of the king. 1647 The king is held prisoner at Hampton Court where his children are allowed to join him. He escapes from the palace on 11th November. 1649-1650 After the execution of the King on 30th January 1649, Richmond Palace is sold to private purchasers - a 3-man consortium - for £13,562 0s 6d. The sale is completed on 10th July. 1650 The Lordship of the Manor is acquired by Sir Gregory Norton who has been involved in the execution of Charles I. 1651 On 30th October, William Leaver is fined 3s 4d for 'driving his cart loaden with stones within ten days last past from the Great House cross Richmond Green out of the usual way to the prejudice thereof contrary to several orders in that behalf made'. The demolition has begun. 1660 The near-ruined Richmond Palace with the manor was granted by the king to his mother, the Queen Dowager, Henrietta Maria. She finds it a comfortless home and soon leaves. 1662 On 29th May, the king and Catherine of Braganza – recently married – arrive at Hampton Court where they stay for over a month. 1665 The royal couple go to Hampton Court to escape the plague in London. 1688 The king orders the reconstruction of part of Richmond Palace as the royal nursery. The baby prince, James Francis Edwards, the future ‘Old Pretender’, is brought there with his wet-nurse. 1689-1694 The king orders Hampton Court Palace to be reconstructed and appoints Sir Christopher Wren as his architect. He also orders the enlargement of Richmond Lodge. 1689 William, Duke of Gloucester, son of Princess Anne and Prince George of Hanover, is born at Hampton Court. 1694 Princess Anne leases a house on the Twickenham Riverside. William, Duke of Gloucester, stays there and exercises his regiment of small boys on nearby Swan Eyot. 1702 On 21st February, the widowed king suffers a fatal riding accident near Hampton Court when his horse stumbles on a molehill. 1710 The queen receives a petition from her subjects at Kew for permission to build a chapel of ease in the village. She presents the site on Kew Green and the sum of £100 and St Anne's Chapel opens in 1714. Three years later she heads the subscription list of the Richmond Charity School. 1718 On 1st October, Shakespeare’s play ‘Henry VIII’ is performed before the King at Hampton Court, recreating events which took place there 200 years earlier. The king dismisses Sir Christopher Wren from his post of Surveyor-General of the Works. 1721 The Prince of Wales, the future George II, purchases Richmond Lodge in Old Deer Park. He later finances the purchase of the land and the construction of Marble Hill House, Twickenham for his mistress, Lady Henrietta Howard. 1727 Sir Robert Walpole takes the news of George I’s death to the new king at Richmond Lodge. New Lodge (White Lodge), Richmond Park, is built as a hunting lodge for the king and queen. 1730 The White House, Kew, is enlarged for Frederick, Prince of Wales and Princess Augusta. They commence the planning and embellishment of Kew Gardens. 1761 After his marriage to Princess Charlotte of Mecklenberg-Strelitz, the king resides at Richmond Lodge. 1768 The Observatory in Old Deer Park is built by William Chambers so that the king can watch the Transit of Venus in 1769. 1772 On the death of the Dowager Princess of Wales (Princess Augusta), the king moves into the White House at Kew. 1802 The king’s Castellated Palace is begun at Kew under the superintendence of the architect, James Wyatt. This ‘singular monument of eccentricity and expense’ is never completed and is demolished 25 years later. 1818 Queen Charlotte witnesses the marriages of the Duke of Clarence and the Duke of Kent at the Dutch House, Kew on 11th July. She dies there on the afternoon of 17th November. 1824 The foundation stone of what is now The Queen's School is laid by George IV on a site near the pond on Kew Green. The King gives £300 with the condition that the school be called The King’s Free School. 1836 The King gives 200 free seats in Kew Parish Church for the children of the King’s Free School and for the poor. 1837-1849 The Dowager Queen Adelaide spends her last years at Bushey House, Teddington. 1858 Edward, Prince of Wales – the future Edward VII – is resident at White Lodge with his tutors. 1861 The Queen and Prince Albert stay at White Lodge for a while after the death of the Queen's mother and a few months before Albert's death on 14th December. 1886 Princess Mary Adelaide, Duchess of Teck, reopens Richmond Free Library after its enlargement to include a reference library and reading room. 1893 The Duke of York (later George V) opens Richmond Town Hall in June. 1894 The Duke of York (later George V) opens the Richmond lock and footbridge on 19th May. Prince Edward, the eldest son of the Duke and Duchess of York and the future Edward VIII, is born on 23rd June at White Lodge – the home of his maternal grandparents, the Duke and Duchess of Teck. The Queen is present at his christening there on 16th July. 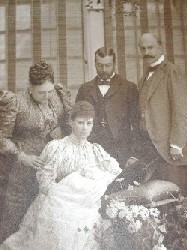 1896 On 8th July, the Duke and Duchess of York open the new Princess May Ward at the Richmond Royal Hospital. On 9th June, the Prince of Wales (Later Edward VIII) opens the first public golf course in Richmond Park. 1924 With Queen Mary, the King opens the Royal Star and Garter Home for Disabled Sailors, Soldiers and Airmen on 10th July. 1925 The Duke of York (later George VI) opens a second public golf course in Richmond Park on 10th June. 1926 York House is officially opened as the Council House for Twickenham Borough Council by the Duke of York (later George VI) on 16th November. 1933 Twickenham Bridge, designed by Alfred Dryland and Maxwell Ayrton, the new Hampton Court Bridge and Chiswick Bridge are opened by the Prince of Wales (later Edward VIII) on 3rd July. 1952 Queen Elizabeth the Queen Mother opens the refurbished Town Hall - which had been badly damaged by a fire bomb in November 1940 - on 16th December. 1959 The Queen visits Kew Gardens with Prince Philip for their bi-centenary celebrations on 2nd June. 1981 The Prince of Wales visits Twickenham on 28th May for their 900th celebrations. 1987 Diana, Princess of Wales, opens the Princess of Wales Conservatory at Kew Gardens on 28th July. 1988 The Quinlan Terry Riverside development at Richmond is opened by the Queen on 28th October.